Running 13.1 miles is no mean feat! But for Amber, a personal determination to make a lasting difference pushed her through training. And on Sunday 6th October she completed the Oxford Half Marathon! So welcome to our guest blogger and running hero, Amber. 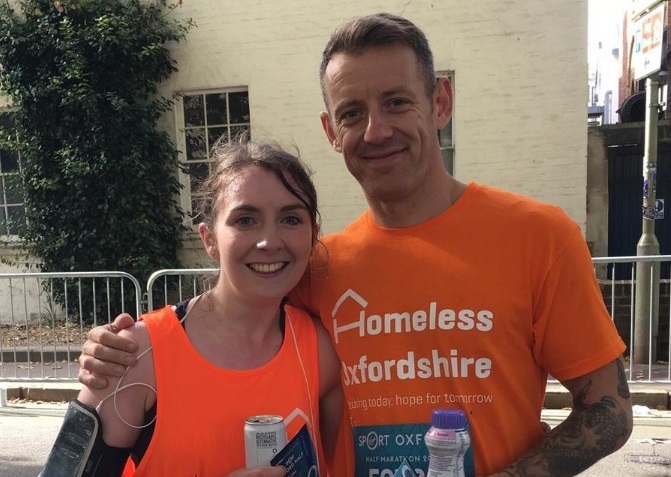 What inspired you to run the Oxford Half for Homeless Oxfordshire? Rough sleeping has increased by 175% since 2012. And without the support Homeless Oxfordshire provide the homeless, it is hard to imagine what would happen to the people living on the streets. Personally, I was never fully aware of how many people were homeless in Oxford and how easy it is to become homeless until two years ago. Since then I have seen at first-hand the amazing work Homeless Oxfordshire do in providing 24/7 support to the homeless. With the day services, rooms, access to support, food, clothes and just being able to talk to a friendly face, these guys work tirelessly giving people hope and comfort. I took part in the Oxford Half to not only raise money to support the charity, but to make people aware of the homelessness crisis in Oxfordshire. What was it like to take part in the Oxford Half? As this was my first half marathon, I was excited to get started and the Oxford Half did not disappoint! The atmosphere was brilliant and there was always support on the sidelines, cheering you on and giving you those all-important ‘Power boosting high fives’. I ran the half marathon with my partner Chris and fully enjoyed the whole experience – although the last two miles felt the longest! The sweets handed out from the sidelines were fully appreciated! How does it feel to know your support will make a difference? Crossing the finish line was not only rewarding in the fact that I had survived my first half marathon, but it was hugely emotional knowing all those steps contributed to raising £585. Personally, knowing the work Homeless Oxfordshire do, it was amazing to know the money raised will make a difference in people’s lives. To know the money will go towards providing shelter, especially during the winter months, and a safe space for people to recover and rebuild their lives is incredible. I could not be more proud in supporting the charity. How should the public get involved in our work? There are so many ways to support Homeless Oxfordshire and it doesn’t have to be running half marathons, or even running at all. It can be anything from taking part in your own event to volunteering at O’Hanlon House. Wish List Wednesday’s can be found on Homeless Oxfordshire’s Facebook and Twitter pages which show a few items that the charity would appreciate. You could also add items such as shower gel, shampoo, socks, toothpaste to your weekly shop and then drop them into O’Hanlon House. Everyone is one step away from being homeless. And I could never begin to imagine how hard it is living on the streets and the hardships homeless people face. The people I have met on the streets and at O’Hanlon House are some of the strongest people I have come across. They fully deserve all the support they can get to rebuild their lives and look forward to a brighter future. Want to make a lasting change like Amber? Run the Virgin Money London Marathon for us! We have one Charity Ballot place available in the 2019 Virgin Money London Marathon, and we’d love for you to run for us! Visit www.homelessoxfordshire.uk/londonmarathon to apply today. Applications will close on Friday the 30th of November and we will let the lucky runner know by the following Friday.